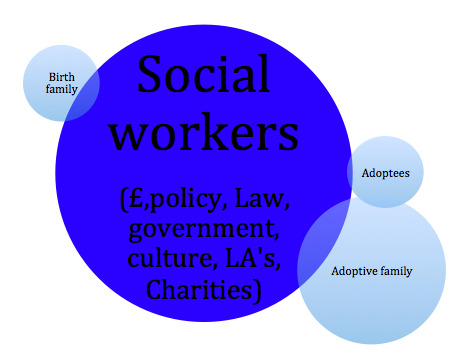 As theoretical model the adoption triangle is fairly clear. 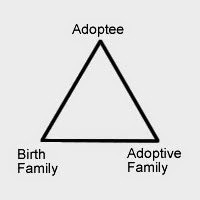 Though it reflects the individuals at the core of the adoption process it doesn't reflect the nature of the relationships or the process of adoption. I find myself waking in the early hours with my mind ruminating on the the challenges faced by all the players in adoption. Increasingly my mind sticks on the position and status of the members of the triangle. In part this is highlighted by my own children moving into adulthood but also informed by my own professional and personal experiences. 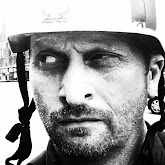 The twitter adoption community feeds and threads are full of comments about challenges faced, mainly anonymous, and often aimed at Social Workers, Local Authorities, policy and government. I would propose that we re draw the adoption triangle and reflect the status of the parties and players. We could argue about the position and size of my infographic bubbles. But for many of the players this is how it feels. What scares me is if I was to have drawn this 50 years ago I'm not sure it would be any different. Keep speaking the truth Mr NS the people are with u!!!! Revolution all the way!!! I'm manning the barricades, nailing my colours to the mast and all that. This is interesting. It reminds me of the Guardian’s coverage of adoption and fostering during lgbt fostering and adoption week a few weeks ago. There was a series of about five to six articles, which contained direct quotes from nineteen professionals (charity representatives, people who work in children’s services, a social worker etc), nine adopters, two foster carers, an adopter’s mother, and the birth child of foster carers. Foster children and adoptees were spoken of, never to, and when their stories were told, they were told by their parents, carers and professionals, or they simply formed a part of the journalist’s narrative. I understand why there would have been so many adopters and foster carers interviewed, as it makes sense given the purpose of the coverage; but could they not have exchanged one of the nineteen professionals for a care- or adoption-experienced adolescent or adult? They were important enough to be discussed, but unlike everyone else, they were not important enough to be interviewed or quoted directly, even in cases where they are now adults or adolescents. The one possible exception (and it really is only a 'possible' exception if thinking about voice) was an article quoting something a six-year-old apparently says, which many would recognise as a quote from a poem: whilst this story was lovely, and certainly deserved a place in the coverage, it does mean that the only quote from an adoptee was something that was reported as them having a tendency to say, and which essentially consists of a young child repeating something they have been told. The views of adoptees and care-experienced people weren’t even incorporated by proxy such as through a charity like The Who Cares? Trust, which deals specifically with the child’s voice. 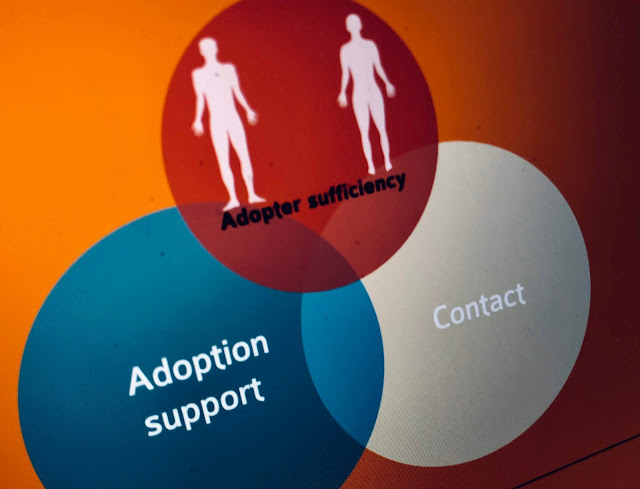 There had clearly been HUGE efforts to interview and quote as diverse a range of people connected with fostering and adoption as possible, so this seemed like a huge oversight. It is odd because given the purpose of the coverage, even just one or two quotes would have sufficed - especially given how much space was given to professionals! I wrote a letter to the Guardian praising the coverage but asking why, since they had quoted 32 people, they had been unable to include the comments of a single child, adolescent or adult with experience of being fostered or adopted. – Didn’t publish it though! I find it hard to remain uncynical at times. As you've highlighted the voice of children is often the last to be heard and listened to. Not to even mention birth families. I'm disappointed that the folks at Guardian Towers didn't respond as it would have been interesting to see why they couldn't or didn't reflect these voices in their coverage. As some will know I recently wrote a book "How I survived in and out of Care" which looks at my time in the fostering and Children's Home system. The interest shown by professionals has been slight - most of the review copies sent out were never reviewed - and I have been left puzzled and disappointed! Total sales on Amazon are under 100. I wasn't aware of your book. Please sent the details through.